The name is the concept: this gig bag is padded all around. 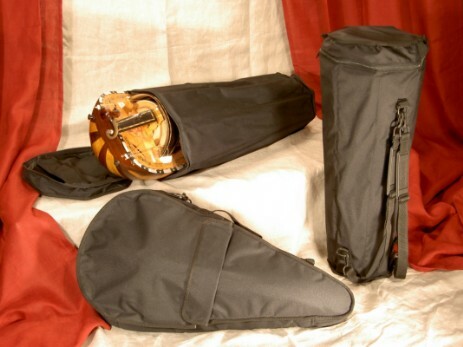 It is light and ideal in all places where you need a rather light protection for your instrument. The gig bag is made - as all our gig bags - from a solid fabric like it is used for backpacks. It has an outside pocket for accessories like cotton or rosin. For transport there's a shoulder strap as well as a handle.. The idea is simple: long pieces of plastic with upholstery foam on the inner side suround your instrument and give structure to this gig-bag. 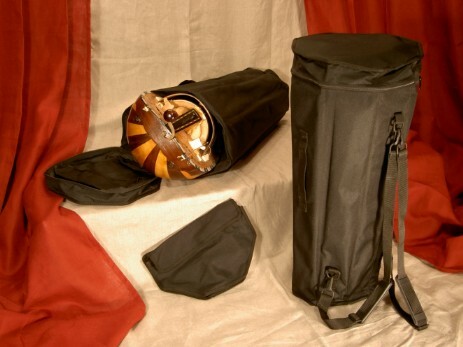 These segments, linked by the fabric of the bag, are flexible enough to follow the form of your instrument and to create the space it needs - and they are hard enough to protect it at the same time. 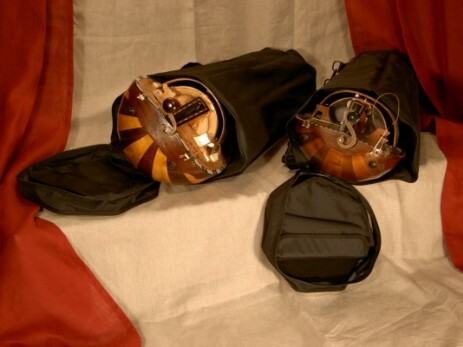 Using the bag as a backpack the gurdy is transported “head-down”, so there will never be any pressure on the crank. and the axle. 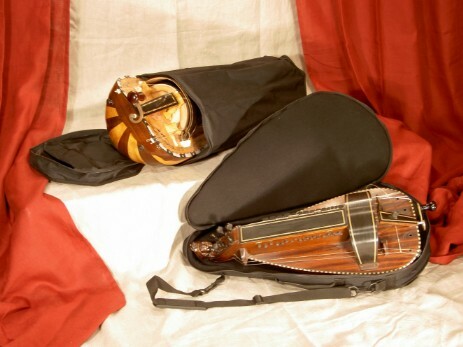 And there´s a place for accessories as well: we´ve placed a removable inside bag in the top of the gig bag giving enough space for cotton, rosin etc. The difference between the two models is the number of segments: the 7-sided is the choice for lute-backs with a smaller belly for example like the newer models of Kurt Reichmann. The 8-sided is the right one for the bigger lute backs like the traditional French ones. Both models have the removable inside pocket, a handle and backpack-straps that can be used as shoulder straps as well. With these measurements we can assist you in finding the best fitting option for your instrument. 7-sided and 8-sided as well as “simply padded” bags in standard sizes are usually in stock - often also in different lengths. And if we can´t find the right gig-bag to fit your belongings we´re happy to order it for you! All prices incl. german VAT excl. p&p!